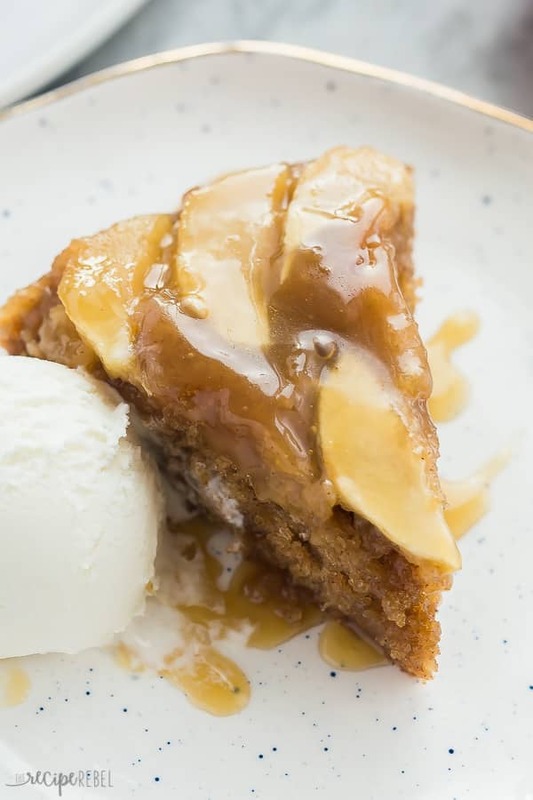 This Apple Upside Down Cake is an easy apple dessert that starts with caramel sauce, tender apples, and a moist cake batter that’s poured over top. Perfect with a scoop of ice cream! I don’t know if you’ve noticed, but I may have mentioned a time or two how deep my love of a warm, gooey dessert runs. 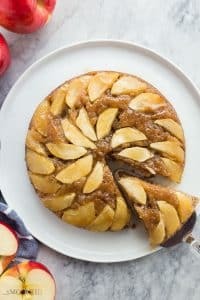 This Apple Upside Down Cake? It’s warm, cozy dessert perfection. My first love? My Grandma’s Hot Fudge Sundae Cake. But then things got a little crazy and I added this Pumpkin Pudding Cake, Red Velevet Pudding Cake, Caramel Apple Pudding Cake, Slow Cooker Cranberry Apple Cobbler, and Slow Cooker Berry Cobbler to the list. It’s a big thing around here. But only if there’s vanilla ice cream in the house! This Apple Upside Down Cake has a beautiful presentation that — if I’m being honest — the pudding cakes and cobblers just don’t have. 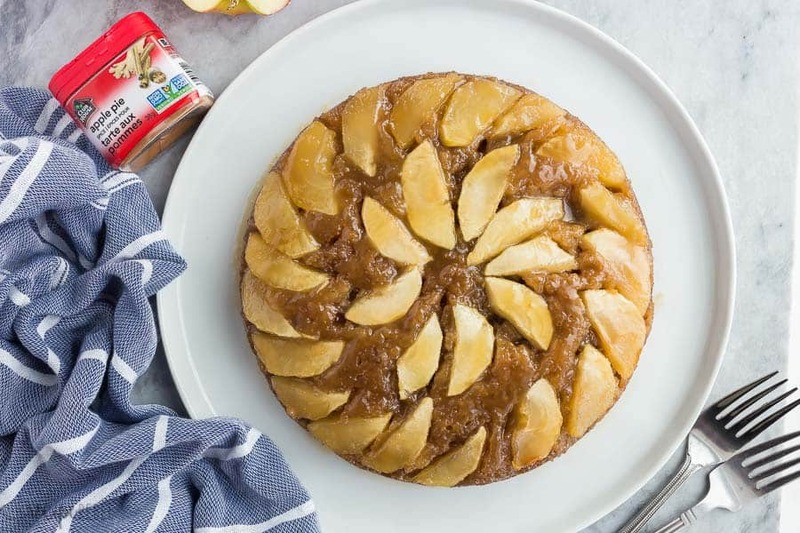 They are gooey and delicious, for sure, but this apple cake, made with brown sugar, applesauce and Club House Apple Pie Spice, and the sticky caramel sauce and circles of sliced apples? It’s gorgeous and sure to be a hit with whoever gets a slice! I used a regular 8″ non-stick cake pan for this recipe, and it works perfectly! You could also use a glass or ceramic baking dish (8-9″ is best), or a pie plate. 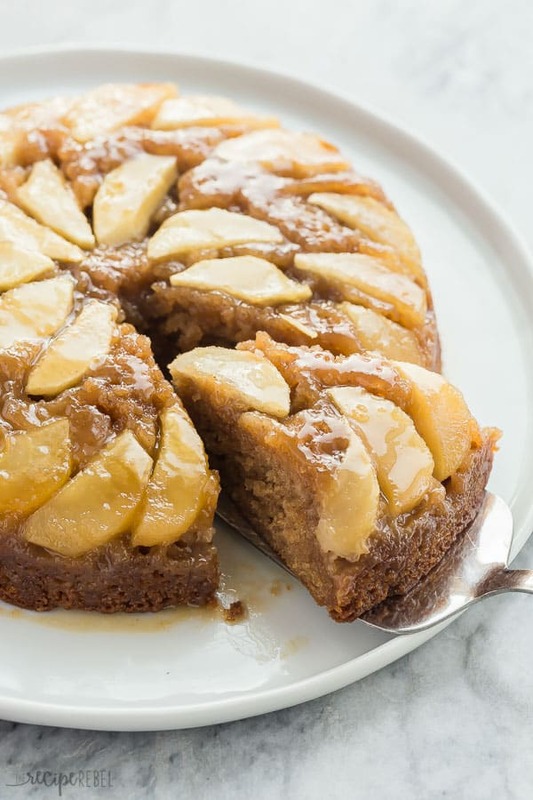 If you want to make this a one-pan apple upside down cake, use an 8-9″ ovenproof skillet to make your caramel sauce, then add everything into that pan. The caramel sauce in the bottom is a super simple combination of butter, brown sugar, and cream. There are a lot of recipes that use only butter and brown sugar and while that’s fine when it’s hot, as it cools it becomes incredibly sticky. Adding a bit of cream keeps this caramel sauce smooth and luxurious. You can arrange the apples in any pattern, or simply dump and spread. You can peel them or not peel them (though for this recipe I do like them peeled), and you can use any of the great varieties for baking. Whenever I can, I like to make sure batters can easily be whipped up with one bowl and a whisk or spoon. This is the reason for the melted butter, but I’ve also used canola oil and it works just fine. I like to give my cake a few minutes to set up before I flip, so that the caramel thickens slightly and some of it remains on the apples. If it’s too hot and too thin, it tends to slide off after being flipped. Which are the best apples to use for baking? I like to choose nice firm apples that are a mix of tart and sweet for baking. You definitely don’t want to use apples that are too soft as they will break down during the cooking process and you won’t have those same beautiful slices. My favorite apples for baking are Granny Smith, McIntosh and Honeycrisp. This is one apple dessert that freezes perfectly and will reheat easily as well. Simply cool to room temperature after baking, then cover the pan in plastic wrap and foil (my Grandma always double wrapped to prevent freezer burn and I still do!). Freeze on a flat shelf so that the sauce doesn’t run. To reheat, leave at room temperature for 3-4 hours until thawed (or mostly thawed), then remove plastic wrap and replace the foil (or a lid). Place in a 300 degree oven for 20 minutes or until heated through. Serve. This Apple Upside Down Cake is an easy apple dessert that starts with caramel sauce, tender apples, and a moist cake batter that's poured over top. Perfect with a scoop of ice cream! In a small pot, combine butter, brown sugar and cream and cook over medium heat until melted, stirring often. Bring to a boil over medium heat, stirring constantly, and boil for 1 minute. Remove from heat. Lightly grease an 8" round cake pan or pie plate. Pour half of the caramel sauce into the bottom and reserve the other half for topping. Arrange apple slices along the bottom of the pan in the caramel sauce. In a large bowl, whisk together butter and brown sugar until smooth. Add applesauce, egg and vanilla and whisk until combined. Add flour, apple pie spice, baking powder, baking soda and salt and stir just until combined. Gently drop the cake batter over the apples and spread to cover. Place a piece of foil under the cake pan and bake at 350 degrees F for 40 minutes or until cake is set and dry (a toothpick inserted in the center comes out mostly clean). Let sit for 10 minutes before inverting onto a large plate. Serve with additional caramel sauce, warmed, if desired.